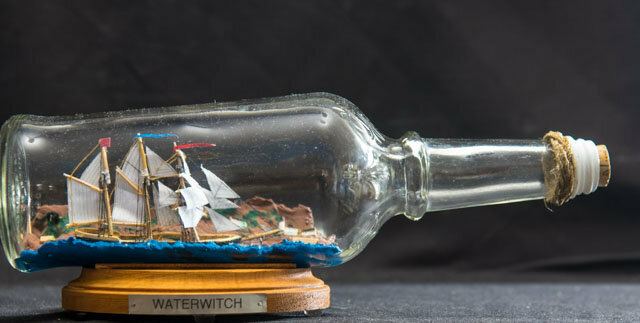 I have been working my way through the examples in Jack Needham’s “Modeling Ships in Bottles”. Here I’ve completed his third of four exercises, “The Waterwitch” which is modeled after an actual historical ship although I am having some difficulty confirming his back-story about the ship since there seems to have been many ships named the Waterwitch. The exercise here was to graduate to making yardarms and square sails which are present here only on the foremast. In my youth I had skipped over all the preliminary exercises and went right into square rigged ships but here I felt I wanted to go back and practice my basics. I also wanted to make use of my collection of bar bottles left over from my father’s bar tending days and here I made use of a Dubouchet liqueur bottle which I felt was nicely ornamented. I also practiced my hand at another head-land back ground with some obligatory sea-side buildings and a little greenery in the hill side. I switched over to a sea made from plumber’s putty colored with artist grade water soluble oil paints which seems nicely compatible and I think this will be my future go-to formula. I also went back and tried making paper sails but I think I prefer cloth sails. I just found some nice antiqued sail cloth which I think will make nice sails for my future SIBs. I also have some tan resume paper which might also be worth trying. I made another attempt at a Turk’s Head knot again using my jig but I think I need to start with a bit more length of cord. Anyway, again the photograph doesn’t do the model justice and I’m happy to have this one in my fleet.